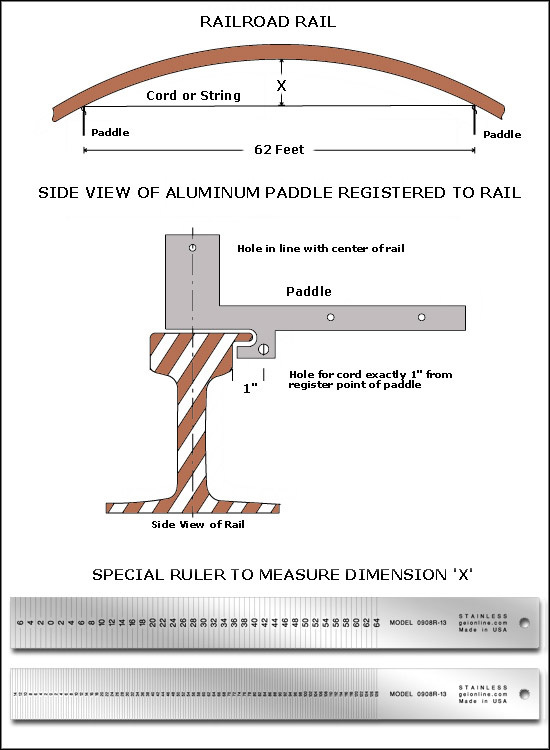 A set of one special vertical reading 9" long stainless steel measuring ruler and two custom manufactured aluminum paddles are used for measuring the curvature and profile of railroad tracks. These items are shown above. The paddles are joined by a piece of cord or string (not usually supplied by the manufacturer) and positioned as shown on the portion of track where the curvature is to be measured. The dimension 'X' in the picture above is measured with the special ruler at the mid point between the two paddles. The ruler has 1" of graduations before zero enabling the dimension 'X' to be measured directly from the scale of the ruler with no calculations necessary. Each 1" measured for 'X' is one degree of curvature.